심환지(沈煥之 1730-1802)는 1798년에 우의정, 1800년에 영의정에 임명되었으며 벽파의 영수로 정국을 주도했던 인물이다. 은 양손을 소매 속에 감추고 의자에 앉아 있는 좌안구분면의 전신상으로 바닥에는 화문석 자리가 깔려있다. 화면 상단에는 “領議政文忠公晩圃沈先生眞”이라고 쓰여 있어 심환지가 영의정이 된 1800년 이후의 작품일 가능성이 크다. 높은 오사모에 짙은 녹색의 단령을 입고 가슴에는 쌍학흉배가 붙어있으며 서대를 허리에 두르고 있다. 비교적 낮은 족좌대와 원근법으로 처리된 화문석, 의복의 두드러진 명암법 등에서 19세기 초반의 사실적인 초상화 양식을 잘 보여준다. 생동감 있는 안면의 사실적 묘사와 정교함의 극치를 보여주는 의복과 기물의 표현으로 미루어 보아, 그리고 심환지의 높은 지위를 고려할 때, 이 초상은 당시 가장 기량이 뛰어난 초상 화가였던 이명기나 그에 버금가는 정도의 화원이 그렸을 것으로 추정된다. 대상의 요체를 포착한 얼굴 묘사로 인물의 개성을 잘 드러내고 있으며, 질감의 특성을 극대화시킨 기물의 표현으로 박진감 넘치는 시각효과를 창출하고 있다. 조선후기 초상화의 특징인 사실성과 장식성의 조화를 잘 보여주며 기법면에서도 매우 뛰어난 기량을 보여주는 작품이다. 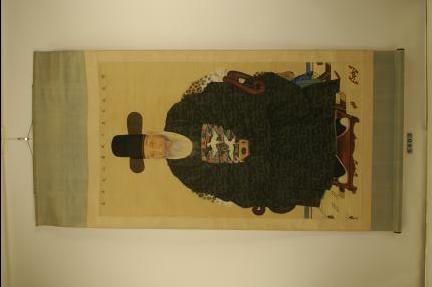 Sim Hwan-ji (1730-1802) was appointed as a third state councilor in 1798 and a first state councilor in 1800. He had enormous political influence as leader of the Party of Principle. In this full-length portrait Sim is wearing a dark green ceremonial robe and a high black silk hat. With both hands inside his sleeves, he is seated on a chair with his face slightly turned to the left. The title along the upper edge reads, “Portrait of Master Sim Manpo, First State Councilor and Lord of Munchung,” suggesting the portrait was painted after 1800. The relatively low footrest, the decorative rush mat expressed in perspective and the robe showing chiaroscuro represent the realistic portrait style of the early 19th century. In view of the extremely precise depiction of the face, costume and props as well as the subject’s lofty status, the portrait is presumed to be the work of Yi Myeong-gi, one of the most prominent portrait painters at the time, or another court painter of comparable skill. The face successfully expresses Sim’s character as an experienced old politician. The different textures of the props are also skillfully expressed, resulting in dynamic visual effects. The painter displayed ingenuity in harmonizing realistic and ornamental elements, a marked feature of late Joseon portrait painting.